My Aunt Polly flashed long, red fingernails despite her farmwife duties. A large, round woman with black hair and a chin mole, which she called her “beauty mark,” Aunt Polly’s fingernails survived her duties as cook, harvest truck driver and farmhand. When she talked, her red-tipped hands flew wildly through the air as she punctuated each sentence with her deep belly-rolling laugh. Polly married my mother’s brother Jess soon after his release from a German Prisoner of War camp following World War II, and allegedly after his younger brother Frank dumped her for a Texas beauty he met while serving in the Army. My mother related that the love triangle caused a lasting riff between the brothers because Jess always believed Polly came to him by default. Whether she came to him by default or not, I believe my Aunt Polly truly loved my Uncle Jess, who stood five-foot, six inches next to her five-foot, eight inches and weighed about 130 pounds compared to her 190 pounds. She called him “Hun” and always spoke to him with affection as she worked beside him on the farm, cooked his meals and shared his love of farm animals. They never had children of their own, but always welcomed their nieces and nephews with open arms. Jess named his farm animals and could point out and rattle off the name of each. Once raised, he took these animals to the sale barn and watched them go, possibly with a heavy heart. At that same sale, he would purchase a hog or steer unknown to him and send it directly to the butcher to stock his and Polly’s freezer. One year, Jess and Polly raised a lame calf in a pen behind their house, where they named and fed him. Andrew the steer became so used to humans that he would limp to the fence anytime company arrived and bawl for attention. Since a lame animal would not bring much at sale, and after considerable discussion, Jess and Polly decided that, while it would be difficult to imagine, they might send Andrew directly the locker plant rather than purchasing a steer for processing that year. “Once we get him packaged, Hun, we won’t know the difference,” said Polly. A few weeks later, they brought the packaged Andrew home and placed him in the freezer. Later that week, Polly thawed a package of steaks and prepared them for their evening meal. Jess sat down at the table, picked up his knife and fork and stared at the perfectly cooked steak for what seemed a long time, then laid the knife and fork back down beside his plate. “I can’t do it, Hun,” he said, pushing his chair from the table. Polly dumped the cooked steaks for the farm cats and called a neighbor to come retrieve the rest of the meat from the freezer. The following week Jess made the trip to the sale to purchase a steer for butchering. Despite this aversion to eating the animals she and Jess raised, Polly found no such reluctance in preparing meat raised by others, and she constantly sought recipes that left dinners guessing just what she added to obtain this or that distinct flavor. A bit of honey in the sweet potatoes, a can of cola in the ham, a pinch of spice here, an herb there. One of my favorite Polly recipes called for basting a baking ham with a condiment made from equal parts Heinz 57 Sauce® and honey. Once the ham cooked through, she poured the juices from the baking pan into a gravy bowl to serve along side the ham. While not quite as tantalizing as Aunt Polly’s version, I did find a way to bring the flavor of this ham to the single cook. 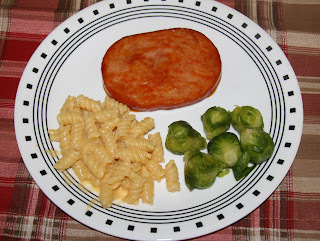 Served with my version of mac and cheese and a green vegetable this meal brings back flashes of memories of my Aunt Polly. Now if I could figure out how she managed to maintain those long, red fingernails. 1. Coat a small non-stick skillet with oil and place over medium-high heat. 2. Fry ham steak until lightly browned, 2-3 minutes per side. 3. Mix honey and Heinz 57 Sauce® together and pour over browned ham steak. Cover and lower heat to medium low. Allow steak to simmer covered with sauce for 4-5 minutes. Turn and cook until sauce bubbles and reduces slightly, 2-3 minutes longer. Pour sauce over ham steak to serve. 2. In same saucepan, heat oil over medium heat, add flour and cook 1 minute, stirring constantly. 3. Whisk in milk and cook, stirring constantly until sauce thickens, 1-2 minutes. Stir in shredded cheese. Add cooked pasta and stir to coat. 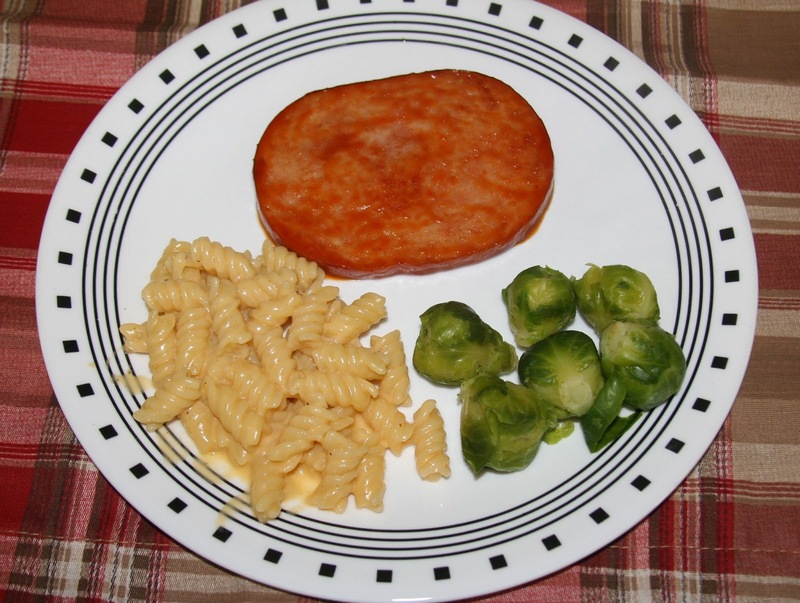 Editor’s note: Sever the ham and mac and cheese with a green vegetable such as broccoli, green beans or Brussels sprouts.